Teri Buhl of Greenwich Time got Larry McDonald’s response to the Repo 105 allegations. Let’s just say he wasn’t shocked by the possibility of fraud at Lehman. [W]e reached out to one of the experts in all things Lehman: Larry McDonald, former Lehman trader and author of the bestseller “A Colossal Failure of Common Sense,” to see what he thinks about the examiner’s report and REPO 105. McDonald told Greenwich Time that when he interviewed one the whistle-blowers in the Lehman case for his book, the whistle-blower said the examiner would find fraudulent examples of GAAP violations. “It’s clearly a balance-sheet manipulation,” says McDonald. McDonald also notes that Lehman sold approximately $12 billion in common and preferred stock to investors in the months they used REPO 105. Additionally he points out a lot of people in Lehman’s CFO and corporate treasury departments once worked for Ernst & Young- and says the next question we need answered is how did these past accounting relationships effect the independence of their auditors. Wow, talk about exposure for Ernst & Young if Lehman plaintiffs can now go after their deep pockets. 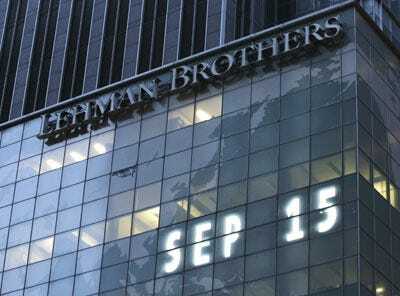 During our interview McDonald noted the Lehman bonds were trading up 1 point Friday to 25 cents on the dollar and there was a lot of activity – a move he sees as big because the Street thinks there is someone else to blame (the accountants) for Lehman’s demise.